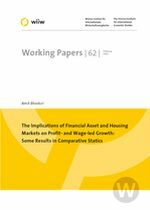 This paper presents a number of extensions to the theory of profit- and wage-led growth by integrating selected aspects of asset markets and housing markets. Theoretical results from comparative statics are then presented and discussed, notably with reference to recent housing market bubbles. The exposition incorporates distributional aspects relating to different classes of economic agents and how those differences relate to wage income versus profit income.